On September 1, I wanted to go a temple that I had not visited earlier. I started checking out on the internet for the temples that I could choose. Sometimes the distances were prohibitive for a 3-4 hour drive. After some research, I selected 2 temples on NH207 – Venkata Ramana Swamy Temple @ Chikka Tirupathi and Sri Ranganatha Swamy Temple @ Kalkunte Agrahara. What a surprise it turned out to be! 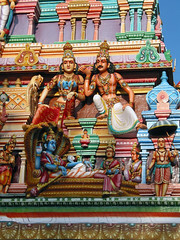 Not much is documented about these temples and there are confusing articles too. Firstly, to sort out the confusion. 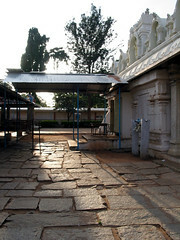 There are 2 Tirupathi representations near Bangalore. One is called Chikka Tirupathi and the other is called Bangaru Tirupathi. Chikka Tirupathi is the place I visited on Sep 1, and Bangaru Tirupathi is at a place called Guttahalli in Malur Taluka in Kolar District (not yet visited). The legend (link 2 below) regarding Agni Devata is associated with Chikka Tirupathi and not Bangaru Tirupathi. 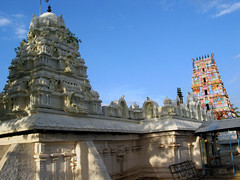 The above temple is supposed to be an important pilgrim center in Karnataka. Considering its fame as the other Tirupathi, I half imagined having to face lots of crowds thronging the temple. When I visited the temple, I was the only person at the temple with the exception of the priest. The temple had just reopened for the evening (5:30PM) and maybe that is why it was so empty. You can read more about the temple at the link provided under point 2. This was the absolute surprise. I did not even expect to get such a lovely drive barely any distance from Bangalore. One advantage for me was that I stay at Kundalahalli (a.k.a. Brookefields) and it is just 9 kms from Whitefield. NH207 starts from Whitefield and goes past Channasandra, Ettagudi and Kalkunte to take us to Chikka Tirupathi. 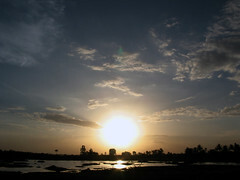 A total distance of about 20 kms from the NH207 starting point. The route is quite unlike what you get to see even upto Whitefield. Shady trees, green fields, vegetable plantations, quiet roads … etc. All the ingredients that make up a nice drive. The road is patchy at a few places, but that can be discounted. :-) Make sure you keep asking the villagers if you are on the right route. Another key to see is for the yellow painted milestones bearing the number 207. The road is not an absolutely straight one, and turns at right angles at places. Any road that has not been tarred well enough or is not wide enough is not NH207. I decided to include this temple after I read the trip report included under point 1. Lovely serene place. It is only a small temple. Once you reach Kalkunte, ask the locals for directions. It is a small detour from NH207. The priest even allowed me to take a picture of the sanctum sanctorum. 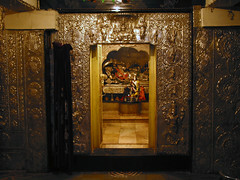 The inner chambers were embellished with silver plates. 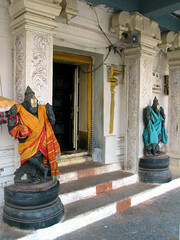 The entrance door had the Dasaavataara embossed in them. 1. Trip report on Team-BHP forum – Kalkunte, Chikka Tirupathi and Krishnagiri Dam. 2. Everything regarding Chikka Tirupathi. 4. Other great places in Kolar district. From anywhere in the city, first get to ITPL gate on Whitefield road. Proceed further towards Whitefield and reach the signal from where you got to take a right turn to go into Whitefield town. Proceed straight from this signal, this is the start of the NH207. Barely any distance later, you reach Channasandra. This place still bears some resemblance to Bangalore’s outskirts and commecialism. 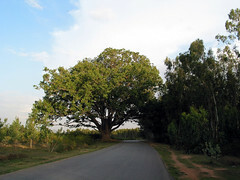 Leave Channasandra and go straight… and you enter pristine rural landscape. All the way, make sure you are on NH207 like mentioned above. You will see distance markers for Hoskote, Devanahalli, Hosur and Sarjapura. Drive past Ettagudi and Kalkunte. There is a huge stone with the name of the village painted on it before each village. 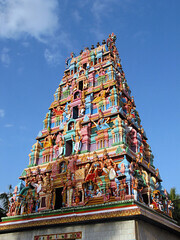 Once you reach Chikka Tirupathi, reach the central market place and ask anyone how to reach the temple. It is in a small bylane. If you are one to visit temples and enjoy the countryside, without having to travel too much, then this one is surely for you. thank you for the lovely pictures and very informative write up. Have included the same in my list of things to do soon! 207 number on yelloe board should be something else, coz this road is not even called state higway. 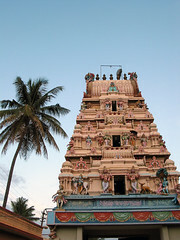 2.Bangaru Tirupathi is at a place called Guttahalli in Bethamangala Taluk in Kolar District. good info r_c, i have heard abt chikka tirupathi, and being at Whitefield, have been planning to visit. But now that you have tested that road, will go this weekend. Fantastic, silkboard! I am sure you will love the drive. @ kariya: thanks for correcting the taluka information. you are right. and yes, it is a National Highway. that is what i have read in all the literature and everything that i have referenced. and it also tallies with my observations from other national highways that i hv driven on. To be frank no one consider wikipedia as a proof coz it is open to edit by anyone without providing any documents. See the url below which os official website of NH in India. Here I cannot see any NH207. @ kariya: pls refer http://morth.nic.in/nh_length.htm, search for 207. Wiki has been updated with the data from this link which belongs to the ministry of shipping, road transport & highways.